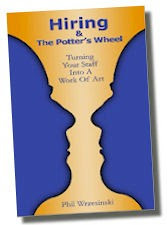 Phil's Forum for Independent Retailer Success: Another Excerpt From the Book "Hiring and the Potter's Wheel"
Another Excerpt From the Book "Hiring and the Potter's Wheel"
Here is another excerpt from my new book. You can buy it here. Mary was ready when Dr. Scott entered the deli. “I learned that even if you have the right raw ingredients, you can still make two mistakes that will keep your pottery from turning out right. First, you have to select the right amount. Too much and you can’t work with it, too little and you can’t get anything done. “The same is true about hiring new people. If we hire too many people they won’t have enough to do. They’ll get bored, complacent or lazy. Too few and we run the risk of burning them out by overwhelming them with too much to do, or worse yet, they can’t get the job done. “And what about the second lesson?” Dr. Scott asked. “That was the fun part. We wedged our clay bodies by slamming them against the table. I still ache from that,” Mary said rubbing her arms. “So are you saying you need to slam your trainees?” Dr. Scott queried. “No, not slam them. But we do need to make sure we get all the impurities out, all of the air bubbles in their previous trainings. I guess I was thinking of the air bubbles as being bad habits they may have picked up, or even ways they were trained to do things that are different from our ways. We have to get rid of their bad habits before they crack,” Mary added with a smile. Transform your staff into a work of art. Buy a copy of the book today.